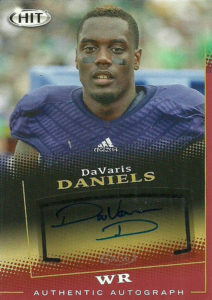 DaVaris Daniels had a mixed college career at Notre Dame due to academic issues. While never fully realizing his potential as a receiver for the Fightin’ Irish, he had brief moments of highlight worthy film. His best year came in 2013 when he had 49 receptions for 745 yards and 7 TDs. He declared for the 2015 NFL draft but went unselected. Daniels signed with the Minnesota Vikings after the draft and then later briefly spent time on the roster of the Patriots. Eventually he found his way North to the CFL Calgary Stampeders in 2016. He earned the league’s honor for the Most Outstanding Rookie catching 51 passes for 885 yards and 9 TDs.